I have actively benn holding open rallies and door to door around six villages of Lutaba, Kavibale, Nkhokwe Kasikizi, Mulinda and Matuli. Around these villages, I sometimes visited households reached by one or four Moslems. These people use material like cloth as means to win the poor to their faith which people easily make a u-turn. During December I baptized nineteen new believers and in January I have had several follow-ups. I have once gone to prison but several visits and lunch hour services to hospital. Pray for us we have moved to new a place where water is very bad. We are sick one after another . my wife and I have been the most unfortunate because right now Kestinah is sick. The new place is where we have built our house close to church. No electricity, no water tap which we have to pay around K150,000 for connection of water pipes from a far line. Pray for Zitha and her Husband. These have been Moslems . Kennedy is sending his report to me in two days so I have to send it to you. May God bless you in just started 2017. On behalf of my fellow brethren I wish to give thanks to God for the support given to us each time. May God Lord bless individuals and couples that are always supporting us tirelessly. I wish to extend my apologies for replying very late due to electricity cuts here that has been worse. What remains of Richard Elias's 20,000 cotton plants are steely weeds and barren soil. He picks dead leaves from the sallow trees, more from boredom than out of hope it will do any good. He watched heartbroken as the rain stopped, and his plants withered and died. For years, the father and his son, Chapepa, harvested the cotton together, earning around 200,000 Kwacha ($370) each year. Now he is penniless, and facing the most severe drought in living memory. 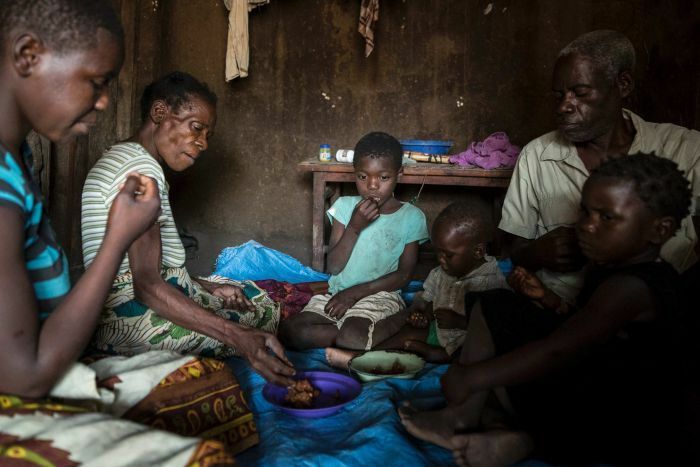 The Elias family are some of the 6.5 million Malawians who have little to eat and virtually no means to obtain it. A severe flood, and now drought, triggered by one of the strongest El Nino events of the past 25 years, have ravaged crops right through the south of the country. Each day Mr Elias faces a grindingly hard routine, as he searches for food, and calms his grandchildren when they cry from hunger. "As the head of this family, it's my job to see to it when things are not OK," he says. Life in Makande, southern Malawi, has always been harsh. The village of mud huts clusters around a makeshift dirt road. This is the second year of drought, and it's pushed all the families here to the brink. Mr Elias has seven mouths to feed: his wife, Theresa, son Chapepa and four grandchildren: Theresa, 18, Precious, 7, Priscilla, 3, and Brave, 19 months. When nothing is on the table, he swallows his pride and visits a relative to beg for food. "They know we're in a difficult situation," Mr Elias says. "But they have their own problems, so I always fear that the support will run out." Monthly food rations distributed by international charities have supplemented their needs — but it's not enough to fill the bellies of the Elias household. Family members do what they can. Mrs Elias collects wild fruit, pounding it into a meagre meal. Chapepa combs the district looking for small jobs as a day labourer. "I feel so much pressure to provide," he says. He is paid with two small bowls of maize. Far from home, he sleeps on the dry soil he ploughs, and takes the stored food back the following day. The Government has recently launched the biggest food relief operation the country has ever seen. "We speak about our difficulties as a family a lot," Theresa says. "But never in front of the children," Mr Elias adds quickly. "We don't want to worry them more." The Elias's have struggled against all the blights Malawi has thrown at them. When HIV swept across the country, infecting millions of heterosexual and homosexual people who knew nothing about it, both Mr and Mrs Elias were among the victims. The virus infected their daughters, and one by one, the four girls died, leaving their children orphaned. 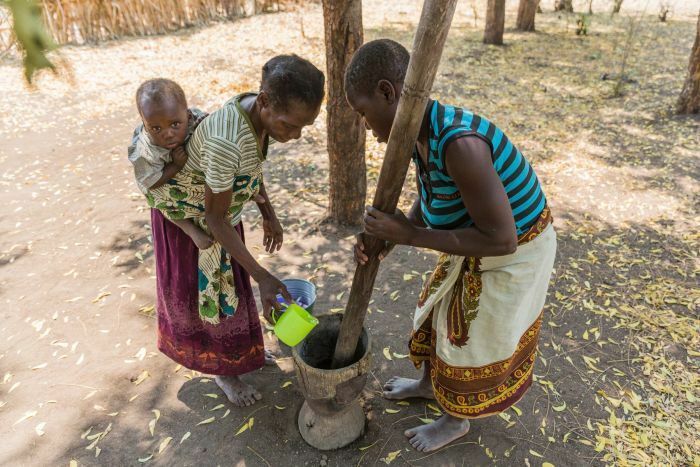 Malawi has one of the highest rates of HIV in the world, and while recent efforts to combat its spread are working, it was left unchecked for years, and over a million people now struggle with the infection. As he walks daily in search of food, Mr Elias's legs ache with the disease. "I'm always in pain, but I have to keep going to feed my family," he said. He wonders if it had to be like this. Why his crops died, when so much water just washed away in the last flood. 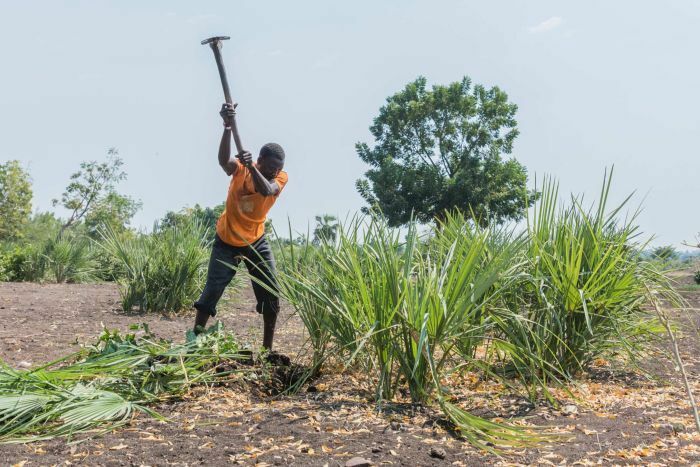 He's well aware the crops grown by Africa's largest sugar producer, Illovo, thrive in his district. Irrigated through private funding, the vibrant green sugarcane mocks his barren plot. There have been plans to drought-proof the nation. One, called the Green Belt Initiative would have irrigated one million hectares of farmland, but it withered through lack of funding. Critics point to endemic corruption in the country, which has seen an estimated $550 million stolen from government coffers in the past 10 years and siphoned away from vital programs. The cash-strapped Government is now scrambling to fast-track irrigation schemes. A new collaboration between the Government and the World Bank, will see water diverted from the Shire River to irrigate farms across the south, extending over 100,000 hectares. The challenge is getting it done in time. It's being fast-tracked with the hope of opening next year. But with the project only at feasibility stage, farmers and the local government hold out little hope. 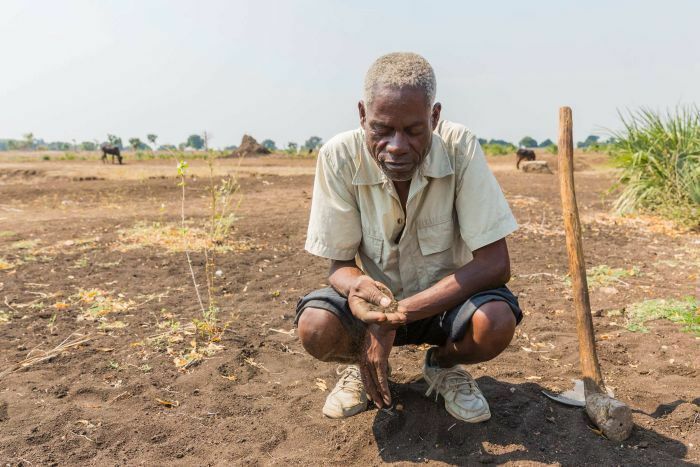 "The problem with this is that we're depending too much on donors like the World Bank," said Chikwawa District Commissioner Bester Mandere, all too aware of the limits of foreign aid. For now, almost 40 per cent of Malawi's 17 million people are in immediate need. International agencies dole out food monthly across the region. 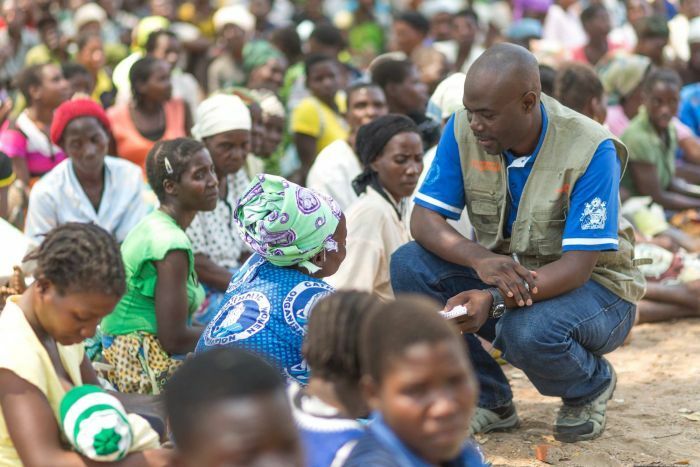 "These rations are the main source of hope families have," says Elisha Kapalamula, World Vision's Humanitarian Emergency Affairs Manager, at a food distribution in Chikwawa. Thousands of people have travelled five kilometres to the distribution to collect beans and a 50-kilogram bag of grain to see their family through the next 30 days. Back in Makande, local government and aid agencies are encouraging families to abandon their ancestral homes and seek safety on higher ground. Another flood is expected in December. But Mr Elias, like most of his neighbourhood, won't be moved. His home may be shabby and fixed together with mud and hay, but it is the only thing he has of value that is left. "The months coming up will be tough," he says. "But I'm hopeful my family will survive." With sadness but blessings that Flocy is not suffering anymore. We send our condolences to Hassan and his son Hassan junior and daughter trinity and daughter hannah. A young family for Hassan to be left with the passing of his wife Flocy. May the Lord comfort the Stambuli family.